"Summer Afternoon on the Willy-B"
Digital Editing of Photograph , 14" x 20"
The many moods and motifs of New York City have long exerted a powerful attraction in my photographic activities. From the grit to the glamour, the beauty to the brawn, there is always a story to be told, and the “to-shoot” list is constantly growing. A lifelong interest when it comes to NYC has been the city’s extensive network of subway lines, especially the elevated sections and the arterial function they serve in linking borough-to-borough, neighborhood-to-neighborhood. And when the elevated borough-to-borough connection involves a massive bridge soaring over a broad expanse of water, it becomes even more compelling for the chance to photograph the trains amidst the geometrically intricate patterns of girder-work. Two East River spans fit that description: the Manhattan Bridge and the Williamsburg Bridge, both massive, both intricate in their early twentieth century architecture. But after walking across both, I must give the nod to the “Willy-B,” the affectionate nickname New Yorkers have for the latter. Not that one cannot get close to the trains on both; but in comparison to its downriver mate, the Willy -B has the better sightlines for photography, both above and alongside the two tracks carrying J, M, and Z trains between Lower Manhattan and the Williamsburg section of Brooklyn. 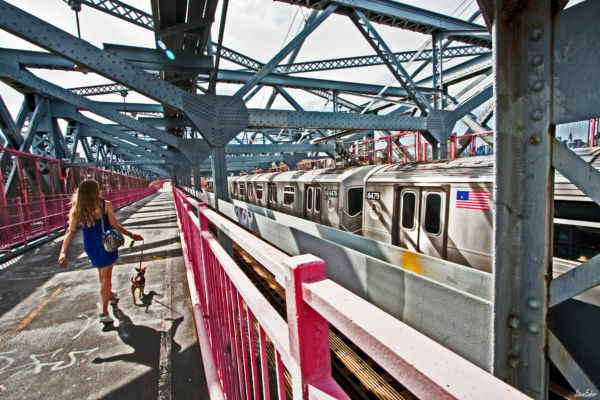 Last June was my time for getting to know the Willy-B, both at track level from the front ends of trains in both directions, and via a leisurely stroll with the cameras from Manhattan’s Lower East Side to Williamsburg, on a photo-inviting sunny Saturday afternoon. The combination of intricate patterns of girders, the passage of trains rumbling below or beside, and the variety of fellow pedestrians made for many an interesting photo moment. I created this impression from one such moment. Steve Ember is a Washington-based photographer, writer, and voice actor/narrator. His areas of photography, in addition to his signature New York cityscapes and Alpine landscapes, encompass European and American motifs, including night scenes, as well as railroad and aviation subjects, and aerial photography. His work has been honored with selection in numerous juried exhibits at galleries in the greater Washington area. His photographs appear regularly at the Maryland Federation of Art’s Circle Gallery in Annapolis, Maryland. His photographs have appeared on covers and within magazines and corporate publications. An extensive selection of Steve’s current and legacy images can be viewed on the web site Foto-Community by clicking on the Photography button at SteveEmber.com and by visiting his catalog on 500px (link below). Steve’s work is also represented on Alamy stock. Steve shoots both in color and black and white, including infra-red, and he remains committed to using film, alongside of digital. Alpine locations, large cities, and industrial motifs strongly appeal to his aesthetic sense. He also is attracted to the character inherent in old buildings, including in European villages. In exhibiting his work, Steve derives special pleasure in sharing with others the fruits of those otherwise private moments of looking through the viewfinder. He also shares the experience and adventures behind certain of his photographs in a series of “Photo-Moments” audio podcasts. Some of these can be heard on Steve’s SoundCloud page, linked below. Steve’s work has been seen in solo and group shows at galleries, restaurants, and other venues in the metropolitan Washington D.C. and Baltimore areas, as well as in Annapolis, Maryland and Old Town Alexandria, Virginia. He was commissioned for a series of black and white Washington scenes for the Scitor Corp. office building along the Dulles Corridor. Three of Steve’s Manhattan impressions were purchased for the lobby of The Landmark Building in New York City. Others of his photographs are in private collections. Steve shares his home with Scamper the Wookie Cat, a lively and very talkative little combination of tabby-stripes and bunny-rabbit white, who hops bunny-like up stairs and supervises the design and production of a line of custom printed photo greeting/note cards. Steve Ember is available for commissions and select assignments.